Through evangelism, Bible translation and discipleship, missionaries serving with New Tribes Mission are planting churches among unreached people groups. 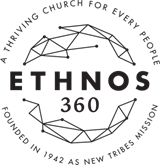 “Our mission is steadfast: to reach new tribes, people groups who have never had a single opportunity to hear the Good News.” Of the earth’s 7,000 ethnic groups, 3,000 are still unreached. “We mobilize, equip and coordinate missionaries. Those missionaries evangelize people groups who have had no access to the Gospel, translate the scriptures into their language, and plant a church.” The Lenz’ serve as Church Planters among the Wahgi people in the Western Highlands Province of Papua New Guinea. Teaching thoroughly through the Scriptures in their heart language. They are working with a phenomenal team of Church Planting, Literacy, and Culture and Language Consultants that are seasoned missionaries with first hand experience to help guide and evaluate their progress and give counsel as needed. In July I asked you all to pray for a man and his wife as I was taking them through the Creation to Christ Bible lessons. He had heard parts of the teaching before, but kept missing key lessons and was not able to put the pieces of the Gospel together to see how it applied to him. This particular man is one who, in the past, has caused quite a bit of grief for our team, and I equated loving him to be something similar to hugging a porcupine. As we know, the Holy Spirit is the one who changes lives and His word says that the faithful prayers of a righteous man produces much fruit. I want to thank you for your prayers for this man as God has removed the veil from his eyes and he now understands the message of the Gospel and proclaims that he is trusting the death, burial, and resurrection of Christ Jesus on his behalf for salvation. He states, “For 19 years I used God’s name and thought I was doing his work, but it was all for my own gain. I realize that was all a waste and is not what will get me to heaven.” Please continue to pray as our new brother in Christ is hungry for more teaching. Pray for his wife as she is conflicted in what to do with the teaching she has received. On the one hand, she would like to believe and put her faith in Christ, but on the other hand, she knows this will result in ridicule from family and friends. 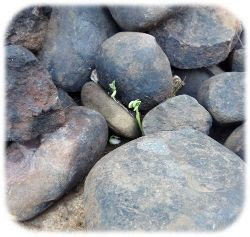 I was visiting my friend James the other day and looked down and saw bean sprouts growing out of a pile of rocks. Oddly enough, I had gone to his house that day in order to ask him if he’d be willing to allow me to walk him through our Bible lessons one-on-one. In the past, we have done many large and small group Bible “courses”, and the results have been as Christ described in Mark 4. Recently, due to our limited time and resources, we’ve been discussing being more intentional with where we sow the seed of the Word. James was one of my language helpers when we moved here in 2009. His wife, a young believer now, has been growing in her walk with the Lord and she’s been devouring the teaching she’s been getting. James has been on my heart for a long time, but he has never really been interested in making the time to listen to the teaching. Now seems to be the right time! I shared with him that his efforts in helping me to learn their language was not without a purpose. The purpose was to be able to share God’s Word with them; but many others are reaping the benefits of his hard work while he has nothing to show for it. He said he wants to hear the Bible teaching and we settled on Monday and Wednesday evenings at his house for the venue. Please pray for James as you did for our brother mentioned above. Pray that the soil of his heart will be ready to receive the seed of the Gospel and that God’s Word will impact him and his family in unimaginable ways. Please also be praying for Robyn and Krystiana as they’re supposed to be leaving from Michigan on Thursday, the 31st, to begin their journey back to PNG. Please pray that the weather will cooperate and flights will not be canceled. Pray for safety and energy for them as they travel. Pray especially for Robyn, Krystiana, and Michael as it is going to be difficult for them to part again for the next several months. Thank you for standing with us in this ministry. It is so sadly ironic that people literally walk past the place where they can learn about the True Life Giving Water in search of something they hope will healing on this earth. Their souls are searching, longing, for something to believe in, something to fill a void in their life, but they just don’t know what it is. Please pray for minds to be unveiled to Satan’s schemes and so that they will hear the Word of Truth and be lead to the True Well. Robyn and Krystiana arrived safely in the US on Christmas day in order to spend the next six weeks with Michael. We would appreciate your prayers as Krystiana is struggling with being away from home. In addition to that, Krystiana started getting sick on the way to the US and has continued to suffer from fevers daily since then. The doctor said today that she’s got an ear infection and has given her some antibiotics. Michael has been struggling with a cold for the last couple weeks and the antibiotics aren’t really working so they gave him some stronger ones today as well. Robyn said she’s starting to get a sore throat. What a way to bring in the New Year. We’d appreciate your prayers for everyone’s health. Also please pray that Michael, Robyn, and Krystiana will have good memory-building times together. Pray for Daniel, Matthew, and me as we hold down the fort in their absence. Thank you for your continued prayers, encouragement, and support of our family and the North Wahgi church planting ministry. This past few weeks the topic of Facebook has posts of children going off to their new classrooms in a new grade. For us, this year has been much different. Our eldest son, Michael has just started off his first year in Junior High at Calhoun Christian School in Battle Creek, Michigan. He’s spending the year with Robyn’s parents. We are thankful for God’s provision for his tuition fees. Though it was a hard choice to send Michael back to the US for the school year, we have seen the positive fruit of that decision as he is being stretched and grown in many ways. God has also blessed us by providing Home School Assistants for the year. Megan was able to be here to get the school year kicked off and she has been doing a great job of overseeing the kid’s school thus far. 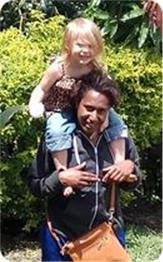 Johanna is still waiting for her PNG Entry Permit. We are hoping she’ll be able to get here soon. We have already seen major benefits to having a Home School Assistant. It has changed our family dynamics in a very positive way by allowing Robyn to be Mom and not Teacher as well. In short, it has decreased school-related tensions and increased the amount of love and affection Robyn gets from the boys. Having Home School Assistants has also freed Robyn up to be able to invest some time into language learning and further ministry with the ladies. In our last update we asked you to be praying for our brother “S” who has been in an ongoing land court case for nearly 3 years now. At the time, we were hopeful that the case was almost over. Unfortunately, things have a way of dragging on. We are encouraged to see how God is working in “S”’s life through these events. We have seen tremendous growth in his spiritual maturity. He has another court date on October 9, but much can happen between now and then. Please pray that his spiritual morale will not fall as well as for his physical safety. We’ve recently started up another literacy class with 15 students. The students vary widely in both age and previous education levels. It has been fun to see the younger, more educated students helping the older, less educated ones. These students are driven by their desire to read the Scriptures in their own language. Please pray that God would open their minds so that they may learn to read fluently. We are also working to train up a couple individuals to help teach literacy with the hopes that they’ll be able to fully take on the teaching of future classes. Thank you for your continued prayers, support, and encouragement. In early November 2017 a dear friend and prospective future elder of the Wahgi church died unexpectedly. We wondered why God would take him now as the church desperately needs leadership other than us missionaries, but we knew deep inside that God must have a better plan in store. Our friend Siwi’s death and funeral provided an opportunity for others who have not heard the simple, un-perverted gospel to have a taste of what they were missing. As a result, a number of people expressed an interest in hearing the Creation-to-Death, Burial, and Resurrection (Phase 1) teaching. The Lord challenged two men to rise up to the occasion to join with our other two Bible teachers in teaching these lessons. We are excited to share that as a result of this latest outreach at least eight people have been born anew into the family of Christ. I am reminded of John 12:24 where Jesus, looking ahead to his own death, said, “…unless a kernel of wheat falls to the ground and dies, it remains only a single seed. But if it dies, it produces many seeds.” Such was the case with Siwi. May Siwi’s life, and death, be a challenge to us all. You can read the amazing account of Siwi’s home-going at https://blogs.ethnos360.org/levi-robyn-lenz/2017/11/23/his-journey-home/. Please continue to pray for the church to grow to maturity in Christ. We are excited to see new Bible teachers being trained up. We’re praying that some of them may one day be church leaders. As many of you may have seen on our Facebook page, Lenz’s View, we had a translation check in October 2017, in which the books of Luke and 1 Corinthians checked by our translation consultant. Overall the check went very well and there were only a few minor changes needing to be made before it was printable. After checking those two books, that makes 59% of the New Testament which has gone through the entire checking process and is ready for print. Another 30% of the New Testament has been drafted and our co-worker Dan and I are gradually working through the various stages of the checking process. The final remaining book of the New Testament to be drafted into the language is the book of John (11% of the NT). 131 verses of John have previously been completed by our co-workers in the initial stages of Bible lesson preparation. This week I have made a start on the remaining 748 verses. We are excited to see the major progress which has been made on the translation project thus far. Please continue to pray that the Lord will enable our team to see this project to completion. Pray that he’ll provide faithful helpers to help us finish the checking process. Pray that he’ll raise up strong readers to be able to read the Word that is being put into their language. In December, after three weeks of daily fevers, Krystiana was diagnosed with “Fever of Unknown Origin”. As the name states, nobody could determine what was causing her fevers; however, blood tests indicated some kind of bacterial infection. Our poor girl turned into a pin cushion as the doctors were trying to monitor certain things in her blood, some of which were at alarming levels. After three rounds of antibiotics her fevers stopped and her blood levels have returned back to the “normal” range for the most part. She has been fever free since January 2 and blood tests last week showed that the one area of most concern has continued its downward trend toward “normal”. At this point she will get a break from the “pokies” until April when we’ll have her checked again. Please pray that she will remain fever-free. Thank you very much for your prayers, encouragement, and support. We are very glad to have you as a part of the team.